You are here: Home / Compounding Lines Newsletter / 2016 July / Raising the “Steaks”! 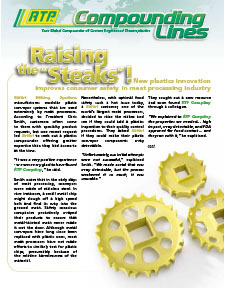 New plastic innovation improves consumer safety in meat processing industry. Safari Belting Systems manufactures modular plastic conveyor systems that are used extensively by meat processors. According to President Chris Smith, customers often come to them with specialty product requests, but one recent request led Safari to seek out a plastics compounder offering greater expertise than they had access to at the time. “It was a very positive experience –we were very glad to have found RTP Company,” he said. Smith notes that in the early days of meat processing, conveyors were made of stainless steel. In rare instances, a small metal chip might slough off a high speed belt and find its way into the ground meat. Safety conscious companies proactively x-rayed their products to ensure that metal-tainted meat never made it out the door. Although metal conveyors have long since been replaced with plastic ones, most meat processors have not made efforts to similarly test for plastic chips, presumably because of the relative harmlessness of the material. Nevertheless, with optimal food safety such a hot issue today, a Safari customer, one of the world’s largest meat processors, decided to raise the stakes and see if they could add a plastics inspection to their quality control procedures. They asked Safari if they could make their plastic conveyor components x-ray detectable. They sought out a new resource and soon found RTP Company through a colleague. “We explained to RTP Company the properties we needed… high impact, x-ray detectable, and FDA approved for food contact… and they ran with it,” he explained. Adding to the challenge, the customer also suggested making the plastic more visible to the eye, helping further decrease the likelihood of a chip making its way through the line. Could RTP Company produce a material in a unique color, as well? “We selected a bright, fluorescent safety green color that would immediately stand out from any ground meat, and RTP Company matched it precisely,” said Smith. The result—a high impact, x-ray detectable, FDA-approved, fluorescent green TPU compound is now being used on belts in several processing lines, and according to Smith, the customer is delighted.